If a career in television is your idea of a dream job, thenhere’s your chance to make that dream a reality. 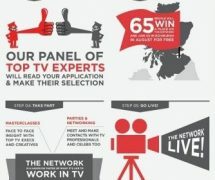 The Network is a free media training event held at theEdinburgh International Television Festival in August, run in partnership with EndemolUK,producers of Big Brother, Deal or No Deal and new BBC drama, Ripper Street. 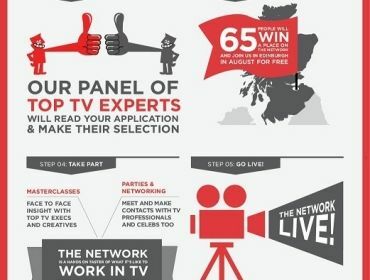 Last year, 65 peoplelearnt from the teams behind Sky News, Waterloo Road, CBBC and BBC 3’s Snog,Marry, Avoid. And, this year, The Network is looking for new talent from Wales to takepart in the scheme. There’s no need to have any qualifications or experience,just a passion for getting into television. As long as you’re 18 or over, youcan apply. Sadly, last year, there wasn’t a single person from Walestaking part and this year that needs to change. There are 65 places available. The deadline for applications is 21st April,2013, and it’s completely free to apply. Successful applicants will have free accommodationand meals in Edinburghin August. Those who are applying will find out if they’re successful by 30thJune, 2013. There’s no doubt this can kickstart a career – over half of thepeople who attended last year’s event have already gone onto work in TV. This is a tremendous opportunity for anybody, over 18, who isinterested in a career in television. Don’t sit on this opportunity, apply now,because those 65 places are limited and will be snapped up. You can contact The Network here.